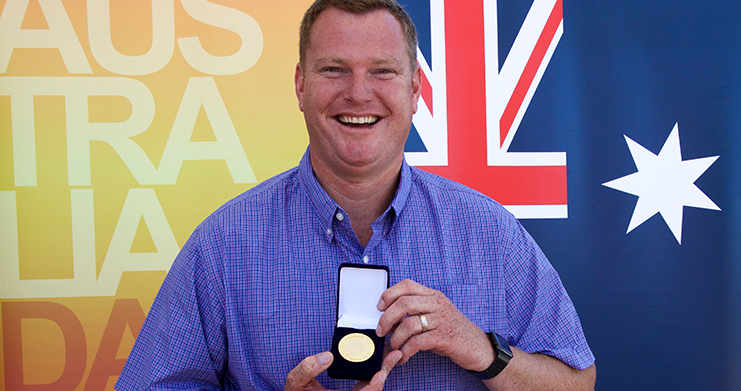 In 2017 our Managing Director Ashley Day was recognized as the Citizen of the Year (Tatong Community) in the Australia Day awards presented by the Benalla Rural City. Ashley was nominated for his outstanding contribution to the wider Benalla Community through his business the LS Quarry group, and also for the contributions made both financially and in terms of his time to assist in raising funds for the Tatong Royal Children’s Hospital appeal. The flow on effect for local businesses supplying Ashley’s Lima South Quarry Group must not be under estimated, the quarry industry is a very expensive industry and supports numerous other businesses such as; automobile suppliers, tyre fitters and suppliers, hydraulic hose businesses, fuel suppliers, spare parts suppliers, office supplies, accounting businesses, legal businesses, mobile mechanics, mobile auto electricians, heavy equipment suppliers, the list goes on – It is estimated the LS Quarry group will inject $13M dollars into the local area in 2017-2018 financial year. On top of all this Ashley still found time in early 2016 to step up his long standing support of the Tatong Royal Children’s Hospital Good Friday Appeal. Having long donated products for auction on Good Friday and then bidding on numerous items on the day, in 2016 Ashley joined the committee as a volunteer and used his influence in the business community to obtain numerous valuable items for auction at the 2016 Good Friday Appeal in Tatong. This resulted in a record year for the Tatong Good Friday Appeal in terms of dollars raised. In addition, a number of local community groups benefit from Ashley’s generosity; Tommorrow Today, Sids for Kids, Swanpool and Districts Development Group, Swanpool Church, Tatong Recreation Reserve, Benalla Saints Football Club and many other clubs and community groups who just need a load of gravel for their grounds.